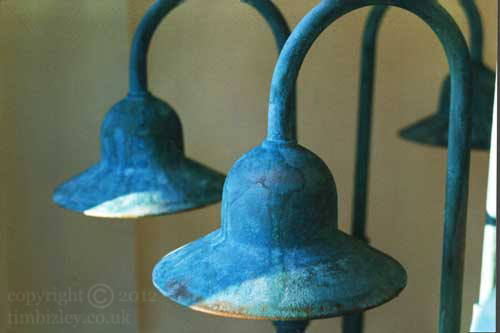 A verdigris paint effect applied to a series of eight lamps and other lighting items which were commissioned for a designed and landscaped garden in London. The imitation of metals which have the patina of age can include metals like Copper, Bronze, and Lead. A variety of shades and hues of colour are apparent in the real materials and can be reproduced in paint. Metal patinas can be used on any paintable substrate and work well in both contemporary and period settings. The oxidization of metals produces the patina of age, and rust, verdigris, and oxides are simulated with paint effects. Verdigris is a particularly attractive oxide having a range of blues and greens of some intensity. For garden designer London U.K.